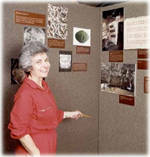 The photographic exhibit “Vaults of Memory: Jewish and Christian Imagery in the Catacombs of Rome”, created by Estelle Brettman and owned by ICS, provides a unique virtual tour of the catacombs of Rome. Glimpses of the Jewish catacombs of Villa Torlonia and Vigna Randanini, as well as of Christian and pagan cemeteries, document the condition of paintings still visible on the walls and ceilings of these underground burial places and the shared symbols of Jewish, Christian and Pagan funerary art. The exhibition has been met with enthusiastic response at the Boston Public Library, the Castel Sant’ Angelo in Rome, the National Academy of Sciences in Washington, DC, the Kelsey Museum of Archaeology at the University of Michigan, and the Bible Lands Museum in Jerusalem, among other venues. The complete Vaults of Memory exhibition in its original website form can be viewed on line. The exhibit catalog is in pdf at: VaultsofMemoryBook. "Vaults of Memory" provides a rare transport back to late imperial Rome with impressive contemporary connotations. The faithful replicas of epitaphs, fragments of sarcophagi, Roman lamps, and the photographs of frescoes and ritual objects reveal precursors of present-day beliefs and symbols shared by Jews, Christians and pagans of the late antique period. Symbols like the seven-branched menorah or the cross, the peacock, the pomegranate, and the dolphin shared meanings of salvation and immortality which transcended a given faith or cult. Several elements of the exhibition seem to preface modern education, medicine, and science. A somewhat startling lesson in anatomy shoes the physician-teacher surrounded by his students while the subject of the lesson appears to be very much aware of the proceedings. Another terra-cotta relief shows a woman as midwife presiding at a birth. The exhibition is the culmination of many years of research and exploration in such burial sites as Rome, Northern Africa, Greece, and the Near East by Estelle Brettman, Executive Director of the International Catacomb Society. Working often with the cooperation of the Vatican and members of the regional superintendencies of Italy, Mrs. Brettman was able to gain access to museum storage and closed catacombs where she photographed with a gas lamp. The photographs and casts in the exhibition come from this research. Particularly evident in the exhibition are inclusions from the Jewish catacombs of Rome, which remain largely inaccessible to tourists and students of religion. The earliest known discovery of a Jewish catacomb in Rome took place in the early 1600s, but the site is now lost. The most recently discovered Jewish catacomb was disclosed accidentally in 1919 by laborers reinforcing the foundations of a stable in the Villa Torlonia. In 400 years of exploration, no fewer than seven Jewish catacombs have been discovered in Rome. Much of the material in the "Vaults of Memory" exhibition is derived from these burial sites. Click here for a photographic gallery of the Vaults of Memory exhibit on display in Boston, Chicago, Washington, DC, Ann Arbor Michigan, Jerusalem, and Rome. Vaults of Memory was made possible by the generosity of many organizations and individuals, including the Lucius N. Littauer Foundation, the Samuel H. Kress Foundation, The Eleanor Nayor Dana Charitable Trust, Massport, the Massachusetts Arts Lottery Council, the Boston Globe Foundation, the Polaroid Foundation. the Bank of New England, the Stone/Teplow Families Charitable Fund of the Combined Jewish Philanthropies of Greater Boston; the Italian Government Tourist Office, and International Catacomb Society members and supporters.